Easily add lightly-grooved patterned icing to your cakes, cupcakes, pies, and more with this Ateco 823 5/16" open star #14 pastry tube. Made of durable stainless steel, this tube is rust-resistant and designed to withstand repeated use without bending out of shape. Featuring an open star tip, you can create shells, stars, fleur-de-lis, rosettes, and flowers. The open star design produces a subtle texture great for a soft presentation. Plus, its small size is perfect for adding intricate details to confectionary creations. Using the right sized pastry tube for the job will enhance your presentation to draw patrons' attention to your display cases and plated desserts. Nice start piping tip. I ordered a bunch of these because they seem to be one of the most popular tips with my Culinary students. We use these a lot in our cake/cookie decorating units. Great product. Great quality. I am really pleased with this piping tip. It is perfect for decorating cupcakes. I am not very artistic but his tip makes decorating much easier and more enjoyable. These are made from stainless steel so they will not corrode. Great quality at an unbeatable price. I own many piping tips from Ateco and all of them work well with the bags, couplers, and cleaning brush as long as you use the correct sized items in relation to the tip on your bag. This company has a huge selection of piping tips and the Ateco 823 5/16" Open Star #14 Piping Tip is one in a line of different sized open star tips. These range from small to large open star designs that can be used together for a varied effect or chosen for the size of your dessert/cake detail. This one in particular is smaller and great for small stars. 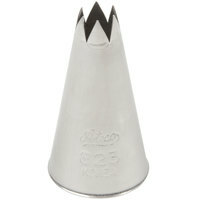 This open star tube is another option for decorating mini cupcakes or other similar smaller baked goods. It’s small, but for those particular jobs it works perfectly well. Open star #3 pastry tube is one of the smaller pastry tubes. It creates a clean and sharp line when piping with it . I do use it a lot for filling macarons or decorating cupcakes and it's need really holding up good. It is a very high quality piping tube. This pastry tube is made by Ateco and has a start shaped 5/16" wide tip. This open star shaped pastry tube is one our team uses often. It works great for decorating cakes, cupcakes, and other desserts. We carry many shapes and widths of pasty tubes in our inventory. This gives our pastry chef many different options when deciding on how to decorate their designs. We would suggest hand washing this pastry tube. A much needed size for layering up a cake starting with the smallest #1 to this #3. There are so many different designs you can achieve with all of the sizes available here. These Ateco 823 5/16" open start #3 pastry tubes create stunning stars that make any baked good, whether it be a cake, cookie, or any other kind of pastry. I think you'll be incredibly happy to use this. The Ateco pastry tube is excellent. It works well with my coupler and is easy to use. I purchased for decorating cupcakes and I have had no issues with it at all. I love the texture of this tip. Especially for adding a different flower shape when doing the hair to all my unicorn cakes. And it's perfect for a star edge! We use these to decorate soap cupcakes. Easy to clean and makes a beautiful swirl. I love that we can buy individual ones and not a case pack. Ateco 823 5/16" Open Star #3 Pastry Tube (August Thomsen) is one of the many thomsens I got for kitchen that gives great detail and ease when decorating. This Ateco tip is a standard star kit. When my 10 year old took a cake decorating class this was one of the tips they strongly advised as necessary. Great quality and price.. These pastry tubes are great! This is an open star #3 which works great for adding detailed designs such as trees and leaves or waves in water. Icing comes out smoothly. I find these pastry tubes to be infinitely better than using cut plastic bags. They are reusable, and you can attach different nozzles to create a different flow. This is a great open star pastry tube. This Ateco 823 pastry tube is made of very good quality material and easy to clean...This tube is perfect for making borders, swirls or shells on your cupcakes, cakes and desserts. This tube is a bit large for fine intricate details. High quality piping tip that we use to add a quick new look to mini cupcakes. It's easy to add a different frosting technique with this tip. These are great to have in many shapes and sizes. They are durable and perfect to add to any collection for a variety of decorated treats. This one uses the medium size coupler. This Ateco 823 5/16" Open Star #3 Pastry Tube (August Thomsen) is good to use with or without a coupler. Easy to use. Great price and quality. Good for large decorative work to get that classic star look. Good metal construction, solid and clean when piping. Get a coupler to make your life easier when changing tips! I buy a bunch of these at a time, as tips seem to disappear around the shop. I like this open star tip for shell borders with some depth to them. I bought this tip to do a swirl ombre design mostly,, and it was fabulous! Ateco tips are a great quality, so I didn't have much to worry about. This open star frosting tip is one of my favorites. I can use it for cupcakes, cookies and decorating cakes. It has a great design that goes with many decorations. This tip is a great addition to our star tip collection. We use them for so many different uses and we love how they can create great rosettes! Love this open star pastry tube! It is perfect for shell borders on cakes, and also for icing swirls for a fun buttercream design on cakes! It is very sturdy and holds up well in the dishwasher too. I'm by no means a professional baker, but I do enjoying baking. I make cakes/cupcakes/treats about 10 times a year for various birthdays and parties/holidays etc. This works for me and the price is great. This tip is exactly what I was looking for. I'm going to school for baking and pastry and this is the same good brand that we have in our kits. Just the right side for moderate cake decorating. I use it for swirls and borders. Not big enough for regular sized cupcakes though but will work wonderfully on mini ones. atecco 823 5/16 open star no. 3 pastry tube, to decorate with icing the cake o do at home, i am very satisfied with the results of this. love this star tip its larger than most craft store so the flower shape has a more ditinct look and come out looking more like a flower. Its great for decorating cupcake and lots more! This is a great durable and versatile pastry tube! It works very well for filling different types of baked goods such as eclairs and cream puffs. The pointed tips work well for puncturing the outside of the item to be filled.